Notes: NB Not first day of isssue. 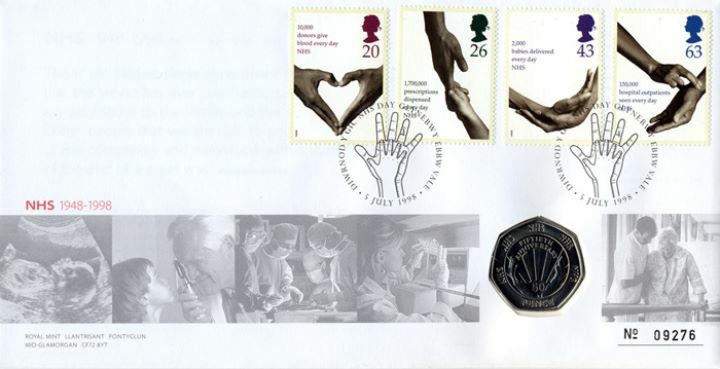 The above Royal Mail Health Service stamps were issued on 23 June 1998 by Royal Mail and feature the following stamp designs: 20p Blood Donors; 26p Vaccination; 43p Babies; 63p Outpatients. The 50p Coin Cover first day cover with the Ebbw Vale, NHS Day - Hands - young and old, Special Handstamp postmark has been produced by Royal Mint and features these stamps which can make a very collectible and lovely gift.